Dan Gildner : President, graduate of UW-Madison, and father of 3 children. He germinated the idea and pulled the organization together. Along with managing the business, he sweeps, backpack blows, sells the service, figures costs, makes quotes and keeps the equipment in sound working condition. Kelly Gildner : Treasurer, keeps the books, schedules and sweeps. Also, a former student at UW-Madison, she works the clock around, is Mom to 3 children, publisher/editor of the Evansville Review and tends her herd of beef cattle on the Review farm. Ben Gildner: Production-Sales and 2008 graduate of Evansville High School. He is involved in all aspects of Kleen Pavement including machine operating/repair/maintenance, backpack blowing and pressure washing. Ben shares the enthusiasm for sweeping with Mom (Kelly) and Dad (Dan). He should sweep streets even as Michelangelo painted or Beethoven composed music or Shakespeare wrote poetry. He should sweep so well that all the hosts of heaven and earth will pause to say, “here lived a great street sweeper who did his job well .” -Martin Luther King Jr. 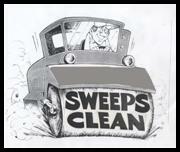 TEAM: Each member of Kleen Pavement is capable of jumping in the sweeper and sweeping. Each knows the machinery and can handle minor or emergency problems on the job. Each takes his/her turn at keeping the equipment cleaned and maintained. Each appreciates that the mission of Kleen Pavement is higher than moving trash and debris around. They all see the greater purpose of sharing environmental responsibility with the citizens and helping mother nature do a better and more complete job.